I have a black thumb. Literally and figuratively. I tell my farmer and food artisan friends if they care to grow the food, I'll take care to cook the food. It's not my job to cultivate it. That being said, I have tried to maintain an herb garden for years. I thought I had it in the bag this year when I purchased some mint at the farmers market during one of my $20 Challenge shows. That was in July. It is now December and the mint is dead. I'd show you, but I'm not into embarrassing myself on the Internet. On purpose. At my last cooking demo of the season, I received a beautiful homemade window herb garden full of two kinds of basil, two kinds of parsley, oregano and sage. Guess what?--dead. I bought chives at the grocery store just last month, hoping I could keep them alive. I can remember to water them once a week right? NOPE. I travel way too much and clearly cannot maintain life in my kitchen. I should be ashamed. But I'm not. Not anymore! I recently got one of these bad boys and I'm COMPLETELY OBSESSED. I've had it for 2 weeks and two of my three herbs are sprouting like mad and I DIDN'T HAVE TO DO ANYTHING. It took 10 minutes to set up and basically I've forgotten about it. OKAY--that's not true. I'm really enjoying watching the basil, parsley and dill sprout up. If you've been following me on Instagram, you have seen the progress of my little herbs and hopefully shared in the miracle of plant-life with me. This sucker is fool-proof! Its so easy and compact, perfect for any home or apartment. I love that my house is about to have fresh herbs year round, and yours can too! Or flowers. Or tomatoes. 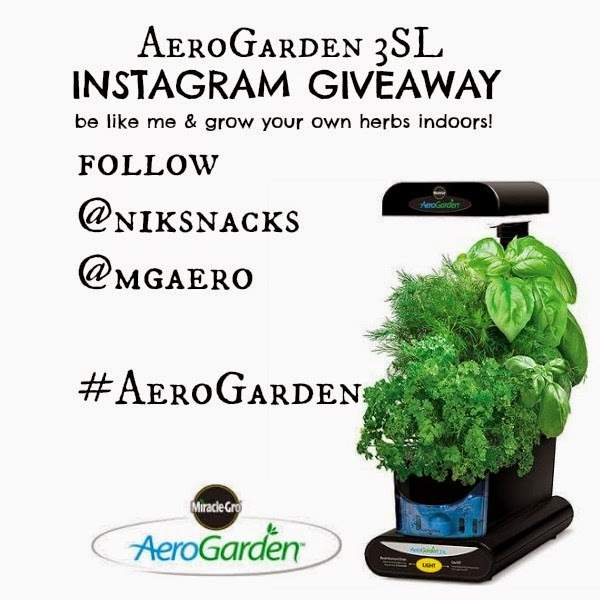 To enter an EXCLUSIVE Nik Snacks AeroGarden Giveaway contest, click on the Rafflecopter giveaway below. Follow the directions and be on your way to winning your own AeroGarden 3SL! DISCLAIMER: Compensation and an AeroGarden 3SL was provided by Kitchen PLAY via Kitchen Witch, LLC. The opinions in this post (and every post) expressed are mine, and are not indicative of the opinions of anyone except me. Nikki, you really *must* have a black thumb -- I mean, mint is an invasive *weed* that will take over the planet! But my herb garden didn't do well this year. There are four that I always grow, and this thing has three of them! Unfortunately, I couldn't enter the giveaway as it seems to require that I be on Instagram, and I'm not. But anyway ... great post! I don't think I've commented yet on your blog's new look -- lovely! I LOVE my aerogarden! It really is fool proof, what an awesome holiday gift! These are the cat's meow! I'm with you on the black thumb! Gardening and I are soooo not a team. I definitely need the AeroGarden! I have a black thumb too, and always leave the gardening to my husband. I definitely need one of these AeroGardens for fresh herbs during the winter! I want one of these so bad! I hope I win! I actually don't have an AeroGarden but have heard great things about them. I'd love to win one. I'd love to win this - we grow herbs all summer long and in the wintertime we miss fresh herbs so much! I can't wait for my herbs to really grow, I've got little bitty ones but at least I've not killed them! I have a black thumb, too! My fiance has bought me -- no lie -- six basil plants, and I killed every one of them. If this is black-thumb-proof, I would love to try it out! I want this for myself. It just seems so easy. Entering! I was so blown away by how well my AeroGarden worked when I first got it (still am). Fantastic giveaway, Nik! I totally have a black thumb too. I finally started an indoor herb garden this summer and guess what? All dead, dead. dead. dead. Guess who needs an AeroGarden? This girl. I have impressive flower gardens all over my yard, like more than you can shake a stick at. I rock at outdoor gardening. But indoor gardening is a whole different story. I stink at it. I need one of these something awful. Ok, if this works for people with black thumbs, I'm in! My hubby is the green thumb in this family! Thanks for the giveaway! I have a black thumb too! More like black hands. I can't keep a plant alive for the life of me. My husband on the other hand looks at a plant and it sprouts a jungle. Maybe I can keep an aerogarden alive. Maybe. oooh I love the footprint of this one! I love my aerogarden, but it's massive and takes up a ton of space. We LOVE to grow things but our house has ZERO light so during the fall/winter season, we get squat. I want to grow herbs year round!! I love this post! I literally want to grow an urban garden here in NYC. Total pipe dream though, as I mentioned- grim reaper status! I think my dude totally has it in him, though. So, I don't have one of these, and I have hesitated on getting one because I, too, have a black thumb. It's the ultimate of ironies too because my great grandfathers were farmers. My cousin is an organic farmer. But me? I kill everything. 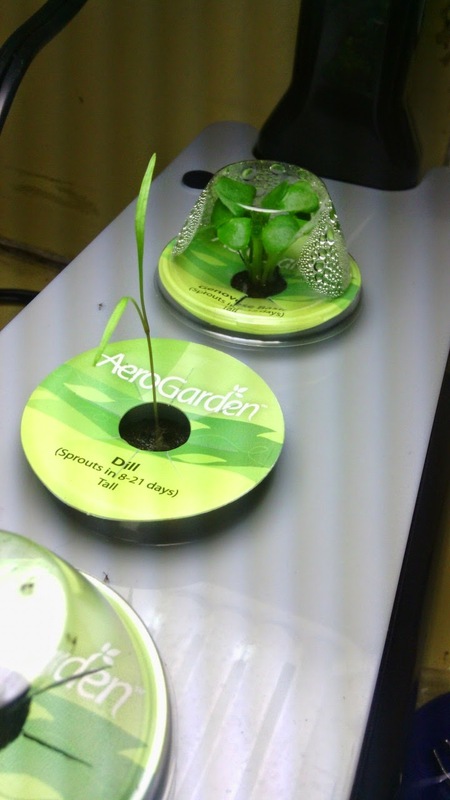 So I will have to give the AeroGarden more serious consideration, since I love the idea of growing fresh herbs at home. Nice giveaway! I have a lovely AeroGarden. Usually, I like fresh basil, mint. I also have black thumb too. I like to give my kitchen a fresh look. That's why I need more AeroGarden.